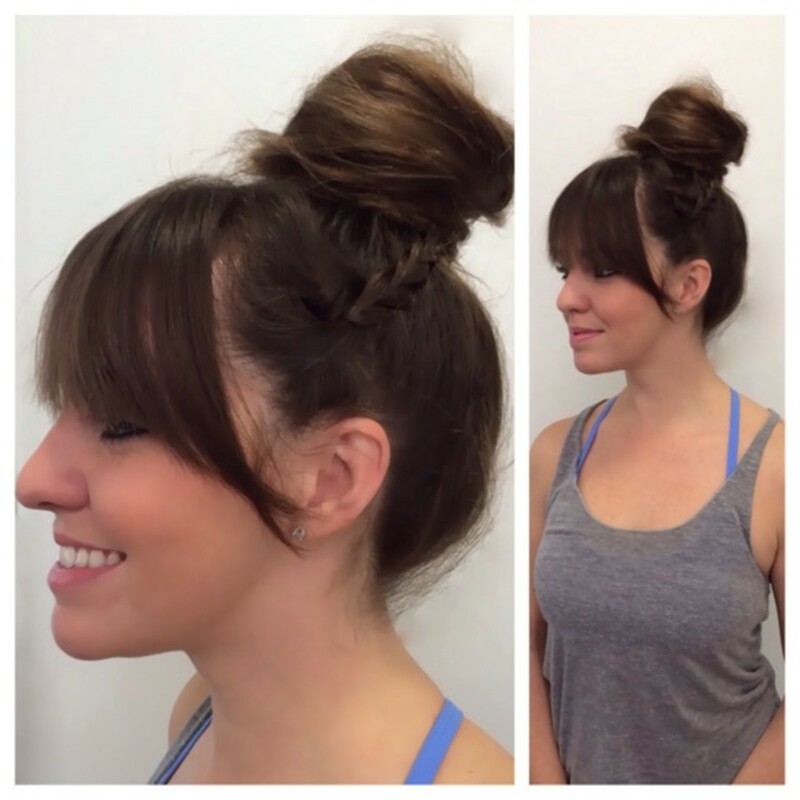 4 Cute Workout Updos for Long Hair: Evict that Ponytail! Check out these 4 fun updos for long hair you can wear to the gym to keep that sweaty mess off your neck. Switch out that boring old ponytail! If you&apos;re a lady who regularly exercises , you know how it feels to scrape your hair back into that same tired &apos;do over and over again. Sometimes my head even aches from the hair being pulled in the same direction for so long. But I also don&apos;t have the time or patience to finagle the fussy, fancy updos I often see in magazines. Is there any hope for cute, doable gym styles that won&apos;t fall out the second I turn up the burn? Rest easy, girls. I made a voyage to Beverly Hills for you to find the cure for the ponytail blues. Alexis Butler, Beverly Hills stylist and fitness enthusiast, feels the ponytail pain. "I had long hair for a long time so I know how boring a ponytail can get. Not only is it unimaginative, but wearing your hair in the same way every day can cause a lot of breakage and damage. It&apos;s good to switch it up and try new things!" So here are 4 simple updos for long hair in the gym that are totally DIY. Alexis let us in on some of her professional secrets to keep those strands in place and get that airbrushed look. Check &apos;em out! Alexis Says: Part hair where desired and divide hair into two pigtails. Take each pigtail and secure it at the top with a thin rubber band. Then, divide the pigtail into three pieces. Braid down to the end of the pigtail. Holding middle section taut, scrunch the other two sections to the top of the braid and secure with a thin rubber band. Take a small piece of hair and wrap around the tie to cover it. Secure with a bobby pin. Adorbs. Alexis Says: Part hair where desired. 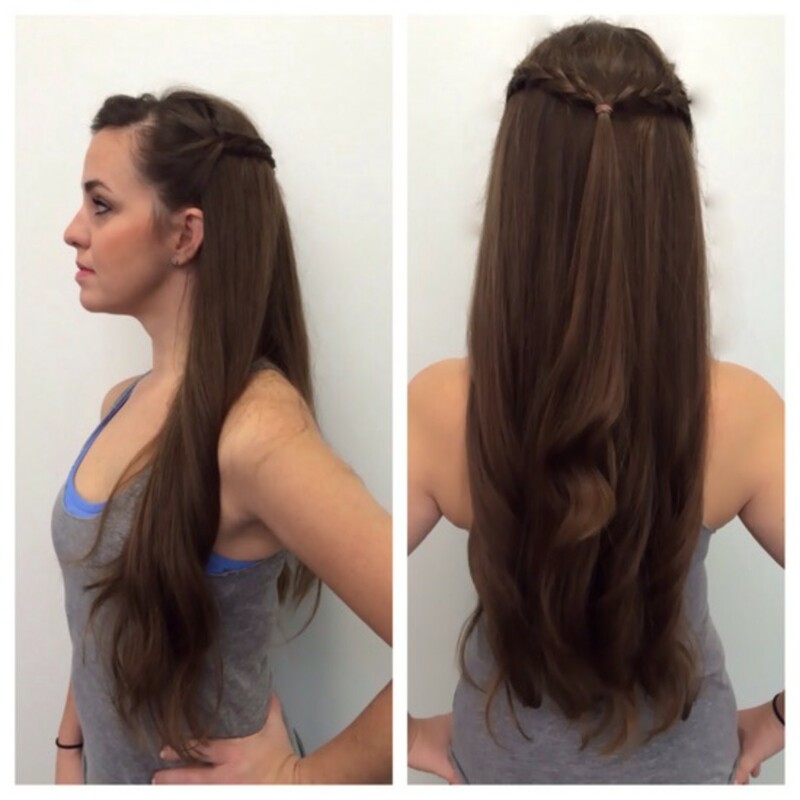 Take the very top sections of your hair and make two long braids, one on each side of your face. Secure the braids at the bottom with a thin rubber band. Bring the braids together at the back of your head and secure with another rubber band. You can then cut or pull off the rubber bands at the ends of the braids. The hair will unravel to the top band. Fab-O. Alexis Says: Depending on how much hair you have, you can do two or three buns to get the mohawk look. Starting above your ears, draw a a part across the top of your head and secure the bunch of hair with a heavy duty rubber band. Don&apos;t worry about how it looks; you&apos;re just separating the hair into manageable pieces at this point. If you&apos;re aiming for three buns, you can part again, starting at the tops of your ears and going around the back of your head. Secure that hair. If you&apos;re doing two, just gather the remaining hair into a final bunch and secure. Do the same with the third section. 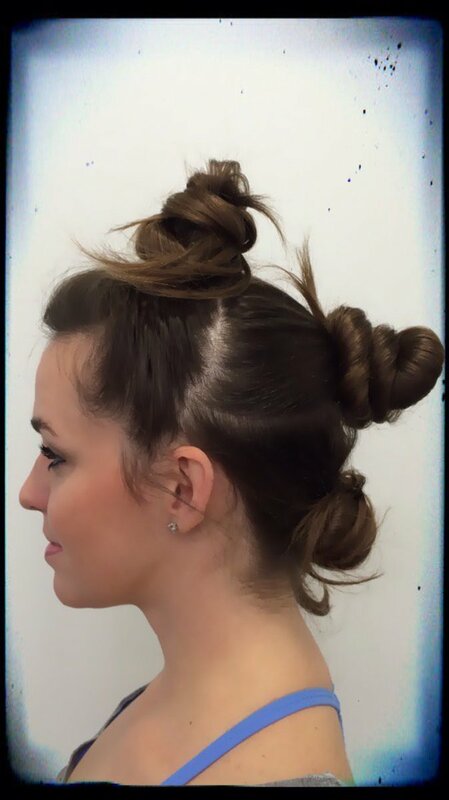 To make the messy buns, start by removing the rubber band. 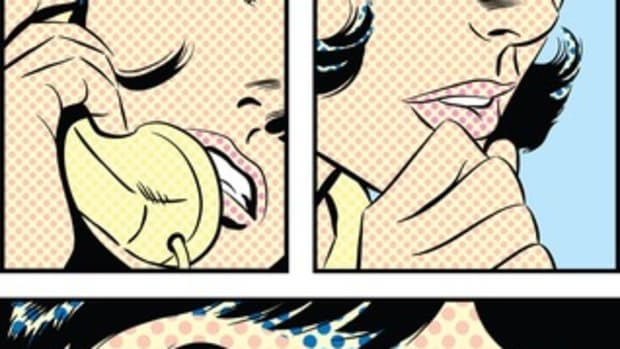 Spray the section with dry shampoo (I like psssst!) for extra hold. Brush the section of hair straight up until it is smooth. Then, twist the hair until it starts to twist around itself and down into a knot. Wrap the end around the bun. You can tuck the end under the rubber band and secure any wild pieces with bobby pins. That&apos;s one tough mama. 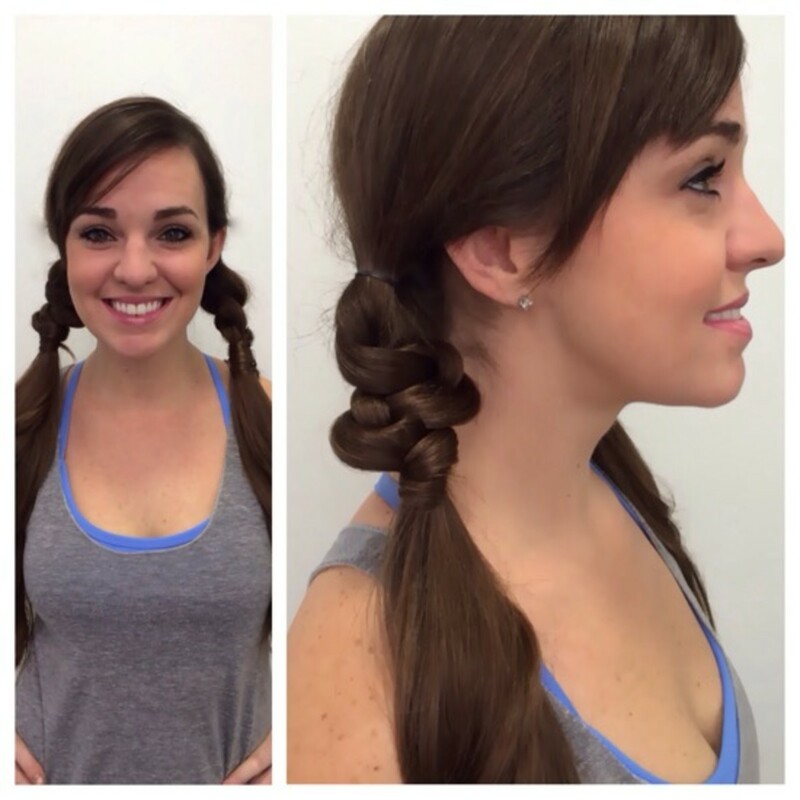 Alexis Says: This is one of my favorite updos for long hair. 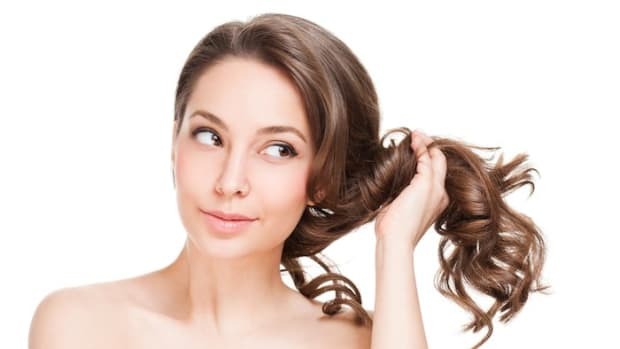 Start by gathering a small section of hair from right above your ear. 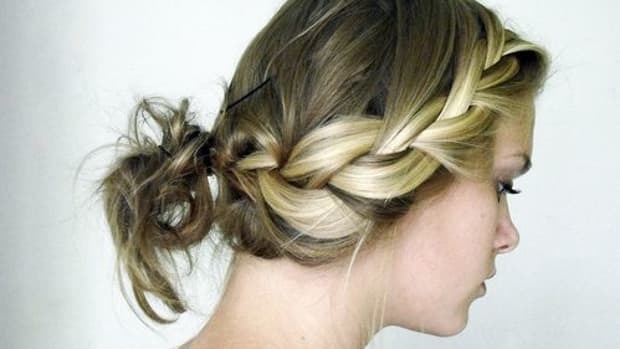 Braid it down to the bottom and secure it with a thin rubber band. Pull the braid to the side or hold it in your teeth and flip your head over. Spray hair with dry shampoo for extra hold. Without gathering the braid up, brush all of the rest of your hair into a ponytail on top of your head. Gather the ponytail with your other hand. Secure with a heavy duty rubber band. Back comb or tease ponytail for staying power. 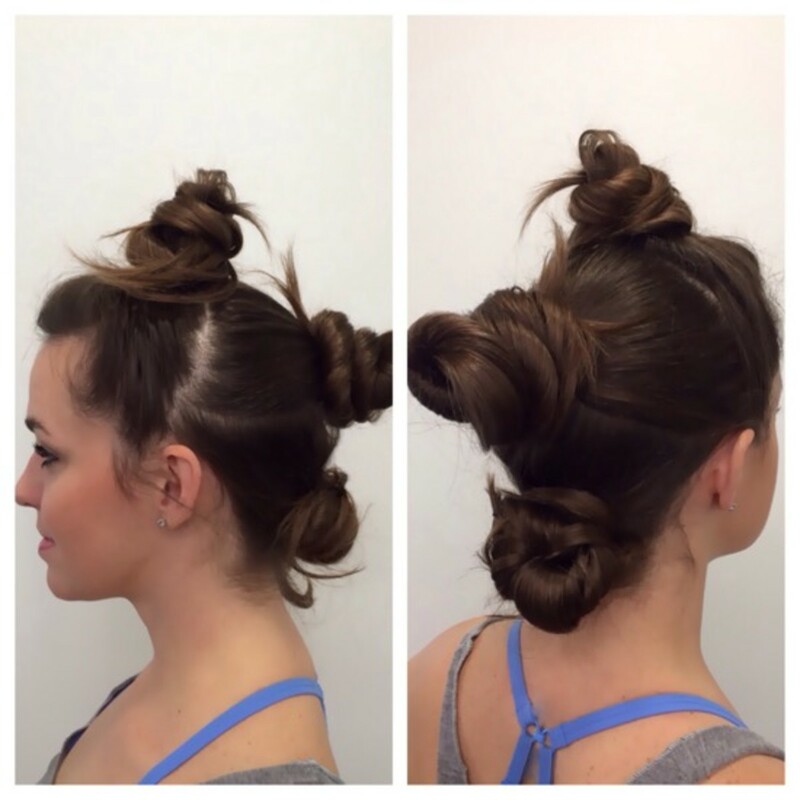 Stand up and wrap hair around the base of the ponytail until a big fluffy knot forms. Secure the end with bobby pins or tuck into rubber band. 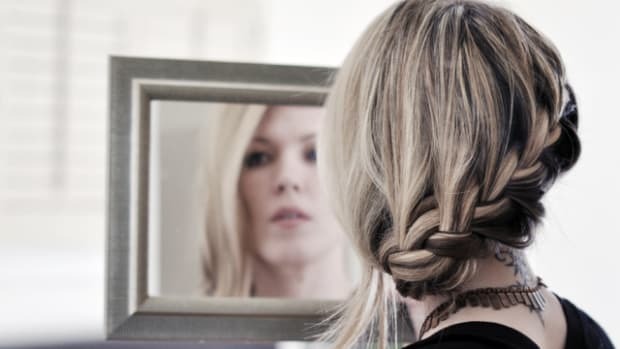 Pull the braid up and wrap it around the knot. Secure end with a bobby pin. Smokeshow.